�The Forge only manufactures made to measure products which can sometimes but not always be more expensive than standard size work. What we can guarantee is the highest engineering standards as our gates and railings do not come off a factory production line . This allows us to provide our customers with an unrivalled service and product range. 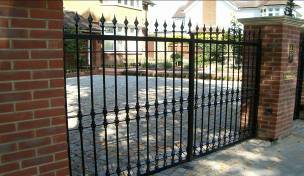 Feel free to design your own gate or even ask us to match an existing pair.